Derrick Cavaco is playing the WSOP Main Event hoping to raise money for Camp Hope. If the next 10 days go perfectly for Derrick Cavaco and he wins the 2018 WSOP Main Event, he will pocket exactly zero dollars. If he busts before the money bubble bursts, it will have cost him exactly zero dollars. 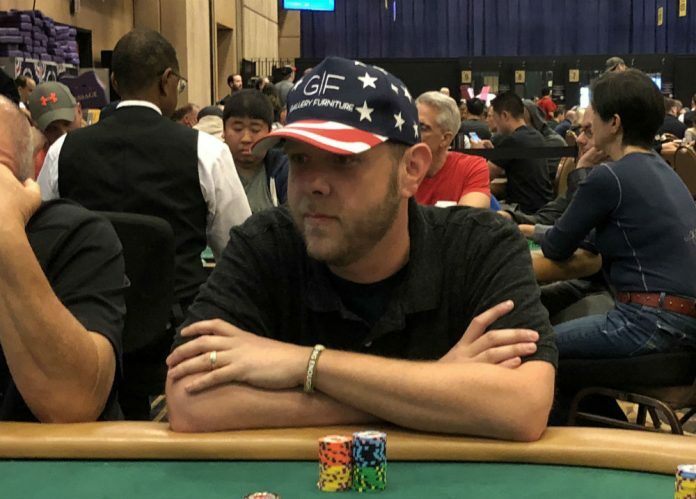 Cavaco, who hosts a poker radio show in Houston, Texas, is playing the Main Event to raise awareness – and hopefully money – for Camp Hope, a peer-to-peer counseling group for veterans with Post Traumatic Stress Disorder. The $10,000 buy-in was paid for by Jim McIngvale, a Houston-area businessman you might actually know better as “Mattress Mack”. Anything Cavaco wins goes straight to Camp Hope. Cavaco is well aware that just 15% of the field is going to make the money and that just one of the 7,000+ players will get to walk away with the top prize and title of World Champion, so also he’s using his time in Las Vegas to try and bring awareness to the cause. Camp Hope is an important cause for Cavaco because his good friend, Tyler Wolf, served four tours of duty and was dealing with PTSD after coming home. Wolf found his way to Camp Hope where they helped him through the transition back into civilian life. Cavaco visited Camp Hope and left with an appreciation for what it is all about after talking with some of the people who were there. Cavaco first connected with McIngvale through his radio show, Poker Lab Radio. That conversation eventually lead to McIngvale putting Cavaco into the Main Event to help raise money and awareness for the cause. This isn’t the first charitable thing that McIngvale has done though. In the aftermath of Hurricane Harvey last August, he turned his furniture stores into shelters for those who were displaced by the storm. He’s also found the Houston poker community to be more than willing to jump in and help. Cord Garcia and Ray Henson have been two of Cavaco’s biggest advocates, helping spread the word about Camp Hope and the work Cavaco is doing. Despite having played the game for so long, this is Cavaco’s first time playing the WSOP Main Event. Poker has always been a part-time pursuit for him, but one that has allowed his family to have a bit of financial freedom they otherwise might not have. Playing for a cause so important to him gave Cavaco a chance to reflect on how his normal approach to tournaments might not be optimal in this situation. While he’s normally prone to playing tight early and then amping up the aggressive as the bubble approaches, Cavaco is focused on getting into the money before opening things up. Visit ptsdusa.org for more information on Camp Hope.